When it comes to planning your retirement income, it’s incredibly important to consider the social security benefits you’ll be earning. Unfortunately, it’s not as cut and dry as just relying on a given number — the amount of your social security benefits are determined by a number of factors. The good news is that you have a certain degree of control in being able to influence said factors. Don’t let your retirement go to waste! 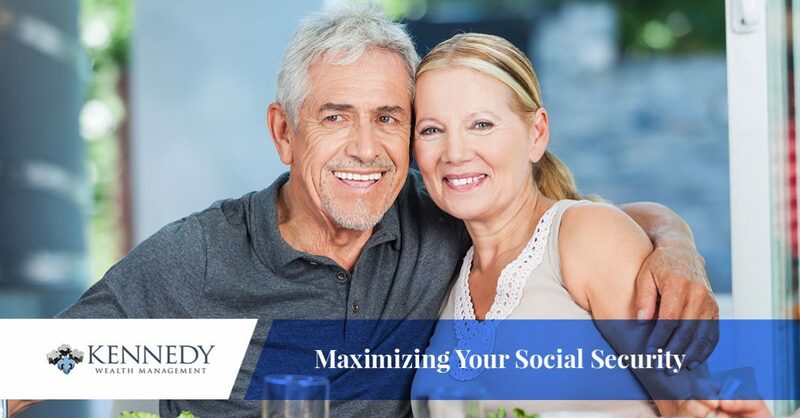 There are several things you can do to maximize your social security. At Kennedy Wealth Management, we can take an in-depth look at your specific situation and give you professional advice on how you can maximize your benefits. Want to know how you can claim the maximum benefit when the time for your retirement arrives? Fill out the contact form on this page to get started with Kennedy Wealth Management today, and keep reading to learn a little more about the choices you can make to increase your benefit. Your Social Security cut is heavily dependent on when you choose to file. However, your check is reduced if you file before your “normal retirement age.” This age varies depending on when you were born — 66 if you were born from 1943 to 1954, and 67 if you were born in 1960 or later. For most people, it’s a good strategy to wait at least until retirement age to collect your Social Security. We use the words at least because it can actually pay to wait even longer than your normal retirement age. You’ll get an extra 8 percent added to your cut (plus inflation) for every year past your normal retirement age that you wait to file. These benefits stop accruing at 70, but that could raise your total check by as much as 32 percent, which is not a negligible number. For most people, it pays to wait. There are context-specific strategic moments where this might not be true for everyone, but you’ll need to sit down with some retirement income planning professionals and look at your specific situation to figure those out. If you’re married, you may be able to claim an additional benefit. Been divorced or widowed? Keep reading — these benefits might still apply to you. If you’re married: If you’re still legally married to your spouse, one of you can claim a full spousal benefit, which is equal to half of your partner’s full retirement benefit. If you’re divorced: You may be eligible for an ex-spousal benefit if you were together for more than ten years, the amount of which is determined by your ex’s retirement benefit. Both you and your ex can claim this — whether or not the other one chooses to. If you’re widowed: If your loved one has passed on, you can claim a “survivor’s benefit” that can be up to 100 percent of your spouse’s retirement benefit. However, this amount depends greatly on context-specific factors, such as when you choose to file, which is why it’s a good idea to contact professional retirement income planners, like our team at Kennedy Wealth Management in Calabasas. Need help maximizing your social security benefits, setting up an IRA fund, getting the most out of your 401k, or saving money in general? There’s no better team to contact than our group of financial advisors at Kennedy Wealth Management, serving Calabasas, Woodland Hills, and the surrounding areas. Contact us today!